Our Blog - Our Organ is Going Toes Up! Our Organ is Going Toes Up! Our Baldwin is broken! Most Sundays, more doesn’t work than works. Thanks to Peteria’s skill, you may not have noticed. It has been a challenge and a large expense to find the repairmen and parts to keep it going. A small group of us has been commissioned to an intense search for its replacement, and I cannot say enough for the diligence and commitment of everyone on our committee. 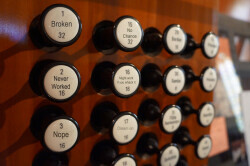 We have met with pipe organ builders and folks installing digital electronic organs. We have traveled to a number of churches to listen to and play various instruments. While everyone on the committee has dreamed of a fine pipe organ for our church, we felt the investment would be more than our congregation could support, and the new digital electronic organs are amazingly good. A few ranks of pipes can be coupled to the digital organ for an even more authentic sound. This digital is not your grandmother’s electronic organ. Comparing a new one to our 25-year old electronic organ would be a little like comparing a new car to the one bought 30 years ago. But I cannot talk about the organ without reflecting on the total worship experience. The purpose of our church organ is after all to lead and assist us in worship. It supports and energizes both the choir and the voices of the congregation raised in song. A good friend had commented, “Well, I am more of a sermon person,” and it is true worship speaks to us in many ways. But there is music in our souls, whether we respond to the traditional hymns of our youth or the energy of our contemporary musicians. When I walk away from worship, I hope to take something into the week that will comfort me, challenge me, move me. It may be a psalm, a prayer, or a something from the sermon. The experience certainly lives on when I find myself humming a hymn, one of the choral responses, or something from the anthem. The music in our worship the last few weeks has been especially inspirational. From the Beatles to Bernstein, from cello to tuba to tympani, if it did not light a little fire in you, your wood is wet! The organ is a magnificent and uniquely versatile instrument. It can calmly underscore prayer or fill the room with energy as we raise our voices in song. When the bride moves down the aisle to Purcell’s Trumpet Voluntary, the organ has a trumpet voice. Its oboe can speak the baroque of Bach, and it can send us into the week with a triumphant postlude. We have recommended urgent installation of a 3-manual, digital electronic organ, which can be used in both the traditional and contemporary services. Last Tuesday, our Board of Directors moved to support our proposal to implement a fund raising campaign to raise $90,000 to purchase and install a digital organ. Phase II will be to explore the feasibility of adding two ranks of pipes to the instrument. Any member of the committee would be happy to answer questions. If you write a check, be sure to designate “Organ Fund" in the memo line. You can give online here. We can do it! So let’s do it now!